Magnitudes of genetic variation within each of major varietal groups of cultivated rice were surveyed in terms of isozyme polymorphism and allelic differentiation of hybrid sterility loci, both of which are considered to have litt le selective value. Allelic differences for 20 isozyme loci were examined in a total of 337 accessions, including Indica and Japonica rices. Aus cultivars from India, Javanica cultivars and both landraces and cultivars from China. Eleven out of the 20 isozyme loci were polymorphic. The Aus cultivars contained more alleles per locus than others. 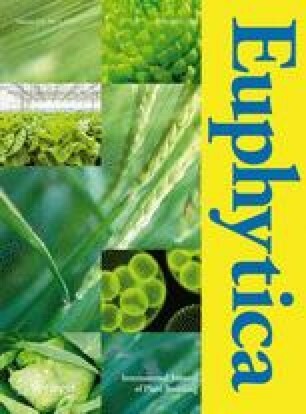 The hybrid sterilities in the crosses among Chinese cultivars, Indica and Japonica cultivars were mainly controlled by locus S-5, whereas the hybrid sterilities of Aus cultivars, when they were crossed to Indica, Japonica or Javanica cultivars, were found to be controlled by allelic interaction at hybrid sterility loci S-5, S-7, S-9 and S-15. Also in terms of the number of alleles at S-5 and S-7, Aus cultivars contained more alleles than others. While the Aus group showed an extreme diversity for both hybrid sterility alleles and isozymes, modern cultivars from the south of YangZi River in China were classified into Indica type and those from the north were into Japonica, which were almost the same as those in Japan. On the basis of the measured polymorphism the Indica-Japonica differentiation was explained by founder effects, i.e., through selection and distribution of two original sources each with a unique set of markers. Contrastingly, the continuous and pronounced diversity in the Aus group was attributed to the absence of such a process. The intermediate groups in Yunnan province and Tai-hu Lake region of China are considered to be isolated from such founder effects, retaining an intermediate diversity in terms of isozymes and hybrid sterility genes. Since hybrid sterility hampers the exchange of genes between cultivars of different groups, the understanding of its genetic basis will be important in rice breeding, particularly in hybrid rice breeding.